We’ll meet at a local residential cooking class kitchen and walk to the local seafood market where you’ll find different Sushi ingredients. Then, we’ll go to my kitchen for a hands on Sushi making lesson. I’ll show you how to make Sushi rice and how to create Sushi rolls that is unique, and delicious. You will plate your coveted Seattle Sushi rolls with your own design. You will roll 3 Sushi rolls and devour your own creations. You will come to a kitchen near Jimi Hendrix park to meet a cooking instructor and other guests. The instructor gives introduction to the class. She will walk to her neighborhood fish store with guests and give tour of the neighborhood. The walk is 0.6 miles about 15 minutes from the kitchen to the fish store. The guests will find ingredients for Sushi at the store. The instructor buys several ingredients which is used for the Sushi class. 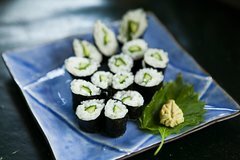 After going back to the kitchen, guests will learn how to make perfect Sushi rice.The guest will make and cut their own Sushi rolls by seeing step by step demonstrations. Each guest will plate their Sushi and taste delicious Sushi. The copy of recipe is included to the experience.